This is my first tackle review, hope you find it informative. I have fished with Berkley Nanofil line for quite some time now and to date I have caught blue kurper, redbreast kurper, canary kurper, bass, smallmouth yellowfish, largemouth yellowfish, smallscale yellowfish, silver catfish (makriel), papermouth, catfish and carp on it – 11 species. I have lost a few largemouth yellowfish on it (think about 3), 1 carp and 1 makriel on it – few fish when you consider that I have caught about 40 yellowfish, not to mention the other species, on it. Nanofil is a Uni-filament line…what the hell does this mean? The answer is simple. It isn’t a braid or a monofilament line – it’s a hybrid. I would describe it as a mono with the traits of a braid. Nanofil is made compressing hundreds of nanofilament strands together – end product being a super thin diameter line which is super strong. It casts like a dream! Nanofil has an incredibly thin diameter. We mainly use 5.7kg Nanofil which has a mind-blowing diameter of 0.10mm. Most other braids have a thicker diameter for the same strength line. The thinner your line’s diameter is the farther you can cast and the deeper you can retrieve your lure. Often when spinning distance and the depth you retrieve your lure plays a critical role in the amount and quality of fish you catch. Top of mind I can think of three past trips where Nanofil made a noticeable difference in my success rate; at Loskop Dam during the past Artlure Nationals I was able to fish small lipless cranks more effectively as Nanofil allowed me to keep my lure in the strike zone, when I targeted smallscale yellowfish at the Crocodile River in Nelspruit I was able to retrieve my lure at a deeper level and the added casting distance helped me land some beauts and lastly at Vanderkloof Dam where I was able to also get the added casting distance required and reel in a 3 cm lure that it bumped on the bottom in 3 meter deep water. The thin diameter also allows for effortless casting. Next feature, which I love about Nanofil, is it doesn’t get twisted nearly as quickly monofilament lines do when casting spinners or spoons. Even after a few days of extreme spinning you will experience limited to no problems with this line twisting. The last feature which impress both my father and me is the abrasion resistance of this line. It seems that the line does well when faced against timber and other structure. Personally I have only been cut off with this line while fishing rocky areas, but then again most braided lines fail when a fish pulls you over rocks. My dad landed a 8 kg catfish this past weekend on 5.7kg Nanofil, the fight lasted 30 minutes as my dad was fishing with light tackle for blues when this cat took his lure – to our amazement the line did not give in even though my father exerted a massive amount of force to keep the catfish away from structure. The con I have experienced with Nanofil is its knots. 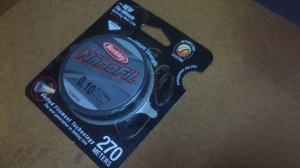 Many anglers differ on this subject when it comes to what knot to use when fishing with Nanofil. Personally I prefer the Palomar knot for this line. I sometimes have to re-tie several times before getting it right, but all the above mentioned pro’s makes it worth it. Remember to always wet your line before setting the knot when tying – this makes a huge difference! Always test your knot after making it, either the line will snap and you will have to re-tie or if the knot is correct the line won’t break for anything. If you test the knot thoroughly you will rarely lose catches. So in conclusion; Berkley Nanofil is a super thin line, that outcast most braids and monofilament line on the market, it is super strong and I firmly believe that it will increase your success rate. I believe so much in this product that I am considering using it on all my spinning setups. Tip: You can make your Nanofil last longer by filling up your reels with backing, then just put enough Nanofil on to allow easy casting. This way your Nanofil will last longer. What is the highest breaking strain I could use with the smallest of the salmo hornets the 2cm i think it is..? Hi Mark, I have fished the 2 cm Hornet on 20 lbs Fireline Crystal which is similar to Nanofil. What do you intend to target? I currently use 12 lbs Nanofil for most Hornet fishing and it casts these small lures like a dream and have landed up to 8kg catfish. Only saw your reply now..
That answers my question for me thanks.. I always use 12lbs either siglon fluorocarbon for bottom fishing of plastics, or Berkeley big game for everything else for my bass fishing.. Both theses lines have fenominal knot strength when tied properly.. I do find though that the fluorocarbon doesn’t cast as well as the big game because of its stiff ness.. So am very comfortable fishing 12lbs..